I just bought a 1994 Camaro with the factory 3-speaker Bose system. Its a very weird system and I'm disappointed in GM for cutting costs and neglecting to put speakers in the sail panel, even though there are cutouts for them. I'm definitely upgrading the entire system, no question. I've learned that the factory speakers have their own individual amplifiers. I plan to replace the receiver for a Bluetooth unit, and the front speakers in the doors. I also will be installing speakers in the sail panel where GM neglected to do so. I know this is all possible because the new speakers will jive with the new receiver with no problems. My question is: can I keep the rear Bose speaker intact and hook it up to my new receiver, along with all my new speakers? I will essentially be building a 5 speaker system: 4 new speakers and the 5th speaker being the original Bose unit in the very back of the car. Also, I'm having a hard time finding a wiring schematic for the 3 speaker system. All the ones out there for the Bose system are for the factory 5 speaker system. Any help is appreciated. My car didn't come with the Bose and I'm happy, was less to remove. I do have a question: the third speaker in the back is it a subwoofer? I've heard that Bose uses 1ohm speakers, not sure if that's correct. My 2007 Silverado has Bose speakers and I don't want to touch the system (and it's integrated with OnStar, don't care to bypass that either). In the past I've heard of Corvette Bose systems being a PITA. If they use 1 ohm speakers (and you want to reuse them) you'll have to get an amplifier that is stable at that ohm if you replace the stock amp. To me I'd just want to replace it. Bose speakers, in 1994, might have been better than stock stereo systems but they were a far cry from their home and theater speakers. Sound wise you can find aftermarket speakers that far surpass what those old Bose speakers can do and are much easier to work with. Best to run new speaker wire to each location and that's not difficult either. Maybe I can dig up some info on the Bose systems of the day. EDIT: Here's a link to a thread that pretty much spells out how folks deal with Bose. Either you leave it alone, get some adapters or totally replace everything. Here's SHbox's diagram for Bose systems. As for my Silverado and the Bose system, I don't care for it too much. It sounds decent but I've had better sounding aftermarket systems. I'm just getting older and didn't want to jack with it. The Bose system is a bit confusing. The 94 factory shop manual describes RPO UU8 (only Bose system listed) as a three speaker system - 2 front door and one rear center. The "Camaro White Book" also does not show any other Bose options for 94 or 95. 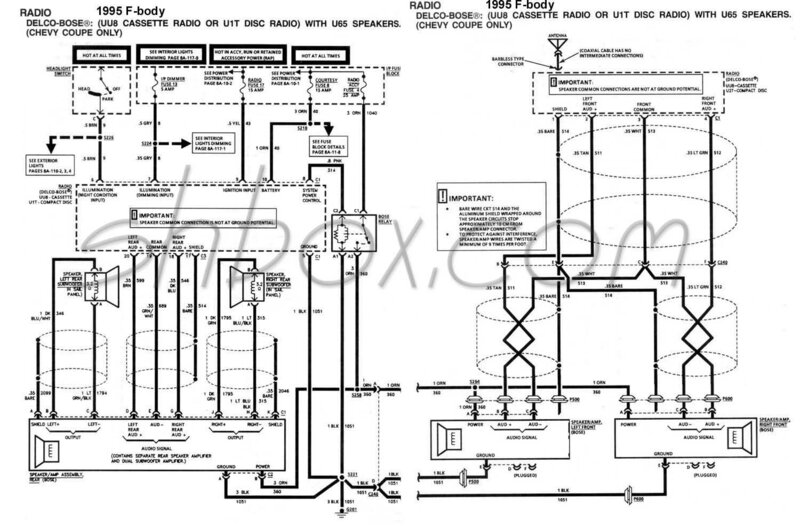 Rob/Shoebox's diagram shows the UU8 system, but adds the note "with U65 speakers (Chevy Coupe Only)". Yet I cannot find a U65 option offered in 1994 or 95, at least not in the factory manual (94), nor in the Camaro White Book (94, 95). I think the Shoebox diagram is the only diagram. You just disregard the U65 left rear and right rear speakers. The Bose system was, in fact, a weird thing to work with. I ended up installing a 4 speaker system and bypassing the Bose "subwoofer" in the back. 4 new speakers, in the doors and sail panels, with wiring independent of the factory harness. I say "subwoofer" in quotes because its really just a speaker with its own dedicated amplifier mounted in a sound chamber. The front door speakers also have their own dedicated amps, which by itself meant I had to run an independent wiring harness. Thanks for the help and knowledge. Hopefully my experience can help someone else in the future. Been dealing with the Bose systems problems since I got mine in 07. Replaced the cassette with CD player (Bose) and about 2 years later the CD player would not eject. SO I bought another CD player, now the reciever on that one took a dump. They sure do not last for very long, I have also replaced one speaker in a door. Thankfully I am not a huge audiophile that has to blast the music when I drive, I would rather listen to the engine hum. Hey red Hawk, Wanna get rid of your bose radio head? I have a 95 Camaro and mine has the 5 speaker Bose system in it.